A HEALTHY SMILE is a BEAUTIFUL SMILE! We're pleased to provide services in cosmetic dentistry, implant dentistry, sedation dentistry and much more. Your insurance is accepted! Drs. Tim Begalke, Jamie Wallace, Jeremy Wallace, Erin Gray and Anne Kelly are general dentists committed to excellence by striving for the quality of care in a gentle and comfortable environment. For reliable dental care from an experienced dentist, see Dr. Wayne Whittaker. This Calgary dentist has been accredited with the Better Business Bureau since 1987. Please call today for more info! Apollo Dental Centre, Calgary provide all general dentistry services, Cosmetic Dentistry, Orthodontics & Emergency Dental Care. At Aspen Dental Care, we are dedicated to providing dental services in a friendly, relaxed environment. Our clients are always our number-one priority. Call to book an appointment today! The mission of Rockyview Dental Care is to promote oral wellness through establishing a partnership with our patients based on honesty and mutual respect. We strive to deliver the best diagnosis and treatment , that dentistry has to offer! 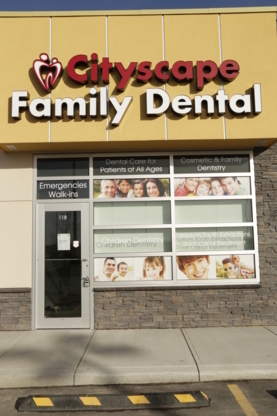 Our office strives to provide our patients with the very best in dental care and guidance. At Somerset Dental on James, our patients receive consistent, comfortable treatment for a lifetime of optimum oral health. Lake Bonavista Dental's expertise and experience, combined with the most innovative technology, will bring your smile to life. All facets of General Dentistry, Convenient Hours, Free Consultations and New Patients Are Aways Welcome! Dr.Robertson and Dr.Redd deliver a holistic and integrative approach to wellness that targets your over all health.From Teeth to TMJ, Molars to Materials.We want you to LIVE WELL! Knowledge is Power. At Pineridge Dental Clinic we are able to do Crowns,Teeth Whiting,Emergency Care,Orthodontics&Restorative.We are a family friendly dental clinic & all ways welcoming new patients. We provide all aspects of Dentistry from dental surgery including impacted wisdom teeth, crowns, bridges, veneers, dental implants, root canals, orthodontics and dentures. Dr. Tamminen enjoys all aspects of Dentistry from dental surgery including impacted wisdom teeth, crowns, bridges, veneers, dental implants, root canals, orthodontics, dentures and hygiene services. DR MIKE MITIC is accepting new patients! Providing for you and your family in a friendly and caring environment with outstanding dental care is part of our Goal! Dr Luethy offers dental services for new and existing patients. Located in Mission on 4th Street Call us today for our hours and to book your appointment. We’ll take the “bite” out of seeing the dentist. New & Emergency Patients Welcome. Please visit our website or call us to book an appointment today! Gentle care For The Whole Family. Emergencies Welcome. New Patients Welcome. Open Evenings & Saturdays. We provide our patients with the finest dental service available!!! CALL US TODAY TO BOOK YOUR NEXT APPOINTMENT!! !